For this baby girl birthday cake I used 2 boxes of Betty Crocker yellow cake mix. I also added 1 cup of sugar, one cup of flour, 8 eggs, some canola oil and instead of the water I used pineapple juice. The cakes were baked in two 9 x 13 baking pans which I previously sprayed with PAM. They baked for about 40 minutes at 350 F.
Once cooled I inverted them on racks until completed cool. I used Dulce de Leche for a filling. Then stacked one on top of the other, cover them slightly with a thin layer of Dulce de Leche in order for Fondant to stick. I rolled 2 lbs. of Fondant (I make my own) and covered the cake. 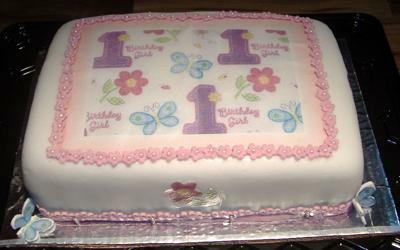 The top was decorated with an edible sheet printed with the same design as the napkins of the party. Little flowers were cut from flower set by Wilton. The butterflies were made of pastiage covered with a butterfly cut out from edible paper too. A tiny edible pearl decorated each flower. It's so adorable you did a great job!